Here is the inside bath, Uchiyu, of Suzumeno-Yu which is undergoing renovation work smoothly. Dressing rooms will be made for each man and women each side of the place where the inside bath was. 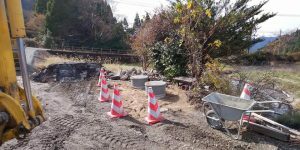 Currently, we enter the foundation work, and at the same time, we are also proceeding with the installation work of the septic tank. As Shiwasu (December) approaches, we have to worry about freezing season. 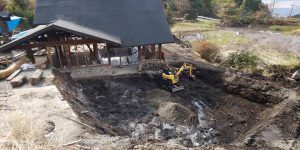 We will do as much construction as possible now to be able to welcome you in the next spring. 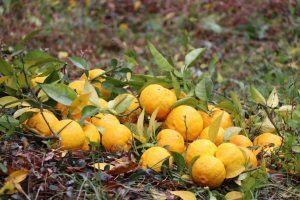 Last week we went to the yuzu field in Kikuka-town, Yamaga-city. Yuzu trees here are 30 years old, and no pesticide fertilizer. 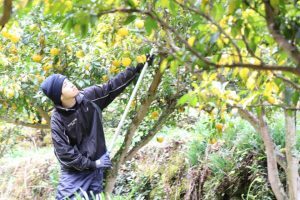 This is a good harvest year, and we were able to harvest a large amount of yuzu. Yuzu harvested this year is for when we reopen in 2020 spring. Yuzu skin-rubbed and become yuzu pepper. Yuzu fresh-squeezed and become ponzu sauce. The white part that covers yuzu-sweetened and boiled and becomes kanroni. It is an annual event, so we will carefully proceed with this work by hand. I will let you know the process. Wishing we can make delicious yuzu pepper. ※We can cook whole things at ease because it is grown up with pesticide-free fertilizer. この無造作に置かれた石材の山。A mountain of stones piled casually. 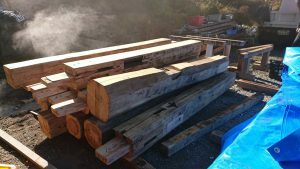 These are the one to be used for “Moto-Yu” bathtub scheduled for construction next year. 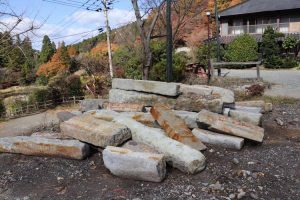 Initially, these were used in former “Moto-Yu,” but let them rest here for a while…and again, they will be reborn into a comfortable bath of hot water. I’m sure it will be more comfortable and pleasant space. Please also look forward to it. 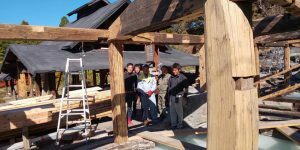 While the beautiful weather continues, the construction of the roof of Suzumeno-yu starts, and the sounds of carpenters hitting timbers are echoing in the mountains. 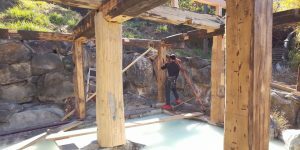 These large and powerful pillars were used previously for the open spa of Suzumeno-Yu and the entrance of the main building. 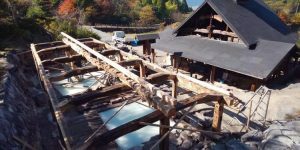 It is very thick and splendid and connects the history of Jigoku-onsen to the future. 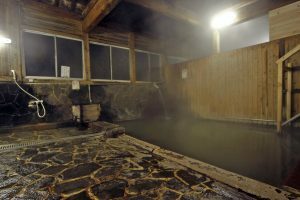 It covers the Atsumeno-Yu and the Nurumeno-Yu with one roof, and people will be able to go back and forth between each bathtub without worrying about the weather even on rainy days. I hope that this pillars will support Suzumeno-Yu for decades and hundreds of years from now. I am looking forward to completion.